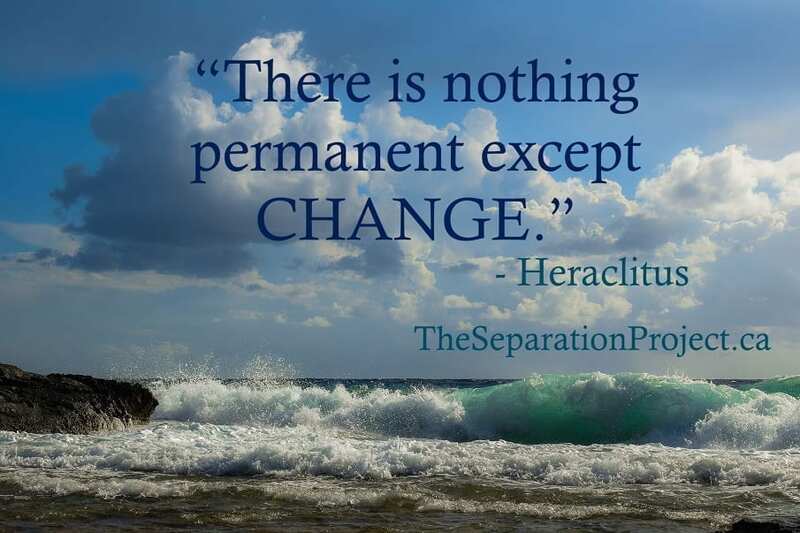 Why is change so difficult and overwhelming during separation and divorce? The extent of the change is usually massive and it may impact all areas of your life. The speed of making the changes is often very fast and there is little time for adjusting, preparation or proper planning. The emotional upheaval during separation and divorce may make decision-making and implementing the necessary changes more contentious and adversarial. I have 6 ideas about change that may make it slightly easier for you to deal with. There is no magic wand to make change simple or easy but here are a few of my ideas that I do hope will help ease the change slightly. 1. Change is the only guarantee we have in life. No matter what stage of life we are in, change is constant. There is no such thing as true stability. Think of change as the waves lapping at a beautiful sandy beach. The waves are constantly changing the coastline. Sometimes the change is difficult to see on the beach and sometimes after a storm the change is obvious and much of the sand has been washed away. Separation and divorce are like a storm washing over the beach and it will cause big changes and test your resilience. Remember that this is just one stage in your life and it too shall pass – change will just continue on shaping your life’s landscape and change things constantly. 2. Change usually triggers fear. We are genetically hard-wired to fear change. Both ‘good’ and ‘bad’ change may trigger fear. Our ancestors evolved and passed on our genes by being safe and not doing dangerous life-threatening things. The ‘fear of the unknown’ is a well-known concept. Ask yourself if your thinking is based on fact or fear when fear starts creeping in. Stick to the facts as best you can. Expect fear and treat it as excitement! Remember that most times in life we do overcome the initial fear we feel, and find amazing things come from the changes we create. We worry far too much about things that never happen. Remember that when we look back at that ‘horrible’ event that altered our life like a job loss, or a big failure, we often learn valuable lessons and end up on a different path. In hindsight, we often realize that the ‘horrible’ event was the best thing that ever happened to us! “You don’t fear change. You fear the unknown. If you knew the future would be great, you’d welcome the change to get there. 3. Accept that some change is out of your control. In a marriage breakdown, spouses often try to control each other with guilt and blame. This never works in the long run. We are all responsible for our own thoughts and actions. We can only control what we think and do – not what others think and do. Accept this fact and let go of the struggle. Focus on what you can control and steer that change in the direction you want. Conserve all your energy for what will help your situation. Accept what is. 4. Know how you react will impact and add to the changes. There will be plenty of decisions to make and things you will have control over. You do control how you choose to think about the changes ( your mindset), how you react and how you act. How you think, react and act will all influence the change itself, the outcomes and further changes. Weigh your options, do the research and work out all the long-term consequences as best you can, then make the best possible decisions and carry through with positive action. If your mindset is not helping you cope well – consider changing your mindset! You get to choose if you are a victim or a victor. 5. Keep emotion from driving the change. I know – easy to say but very difficult to do. Slow down and give yourself time to absorb the changes and feel the emotions. The emotional journey is normal, healthy and necessary. Your emotions will themselves change over time as you go through your separation and divorce. Don’t make decisions that will last your whole life based on the emotions you feel in the heat of the moment. If you are too emotional – postpone big decisions. “Slow down. Calm down. Don’t worry. Don’t hurry. 6. Break all the change down into small steps. The best way to manage massive change is one small step at a time. If you keep thinking about the whole thing it is overwhelming. Break it all down into small changes until it is manageable. The changes during separation and divorce are difficult, but I do hope you found encouragement and some ideas that will help you get through it all. You will be amazed looking back at what you did manage! Please tell me what worked and did not work for you – add your ideas to the comments below! I think fear of the unknown is the biggest challenge of change. A friend once told me knowledge is power and for me this has proven to be so right. When I faced the issue that was unknown or uncertain for me and learned all I could in order to deal with it, my fears went away. It was so empowering. Thanks for a great post Pam! Thank you, Sandra – it is so true – Knowledge=Power! Knowledge definitely helps diminish the fear. Such a timely post for me today, thank you Pam! I really think Point 6 is hugely important to remember. It can get so overwhelming when so many things are in flux, but being able to take a deep breath, take that step back and outline the small steps that have to be taken, it really starts to feel much more manageable. Thank you, Courtney! Yes – step back and pause – take your time – it will all be done eventually! Thank you for this blog Pam. I’m almost 4 years into this single life and taking small steps is the only way. Feeling much better than I did, but it’s a long journey after I chose to leave a 33 year marriage. Thank you for your comment Judi! I love these quotes! My divorce was nearly 30 years ago, so I don’t really remember what it was like, but I do remember losing a job that I loved when a program was shut down earlier than anticipated. It was devastating, but it gave me the incentive I needed it to move forward with my business – something I probably wouldn’t have had the courage to do otherwise. Thanks for the comment Janet – I too love quotes – obviously!